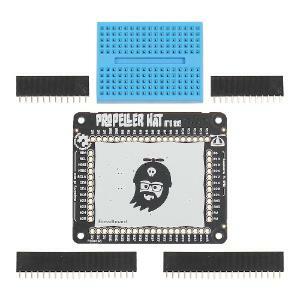 Powerful multiprocessing capability for your Raspberry Pi using the Propeller HAT! What is a HAT? HAT stands for Hardware Added on Top. Once assembled (yes, soldering is required), this Propeller development board fits snugly on top of your Raspberry Pi, adding all of the awesome features of the Propeller microcontroller without adding a lot of bulk or complexity. What can it do? That's entirely up to you. Run servos, control robotics, create a home automation device, drive VGA – be as creative as you want! There's a breadboard area for easy prototyping and female headers for Propeller I/O pin access. 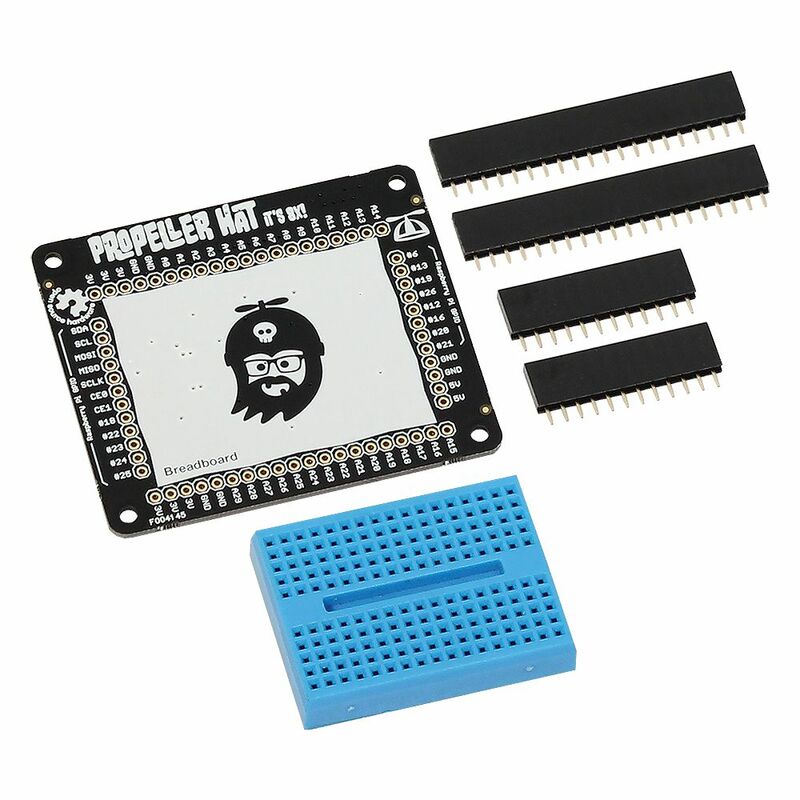 For Spin programming, you can run PropellerIDE right on your Raspberry Pi. Tutorials and projects for getting started are available via the Pimoroni Propeller HAT Projects portal. You can also explore the Propeller HAT GitHub Repository documentation for different ways this hardware pair can play together, such as using Python libraries to flash your HAT with a serial GPIO, I2C, or PWM driver. See the Additional Resources section below for links. Note: This kit comes unassembled. Soldering is required. Caution: You will need to make sure that the solder joints on the underside of the HAT do not make contact with the HDMI connector on the Raspberry Pi. Most Raspberry Pi cases take care of this. Or, you may wish to put a small piece of foam tape over the HDMI connector. A set of 2 brass standoffs are also included with the kit; if you choose to use these, be sure to press the HAT down on the Raspberry Pi pins all the way. Ordering information: Kit contents include 8-core Propeller P8X32A-Q44 microcontroller; 6 MHz crystal oscillator; 3.3 V 300 mA voltage regulator; 17 x 10 breadboard with 0.1" spacing; and EEPROM for Raspberry Pi compatibility.